Will YOU be this year's big winner in Notre Dame's Mega Raffle? Tickets are now on-sale for the 5th Annual Raffle which will be drawn on Sunday, April 17, 2016 at Notre Dame Jr./Sr. High School's Drawing Party! Donation for each ticket is $80.00. Anyone who purchases a ticket(s) by February 1st will be eligible for a special drawing. Raffle tickets can be purchased by filling out a raffle application form. 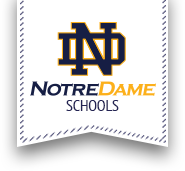 Return completed application with $80 cash donation to Notre Dame Junior/Senior High School at 2 Notre Dame Lane, Utica, NY 13502 between the hours of 8am-4pm on school days. Questions can be answered by calling (315) 724-5118. All proceeds benefits Notre Dame Schools. You need not be present to win.